John and Bonnie Chepulis live in Columbus, Montana, about 45 miles southwest of Billings. John was looking forward to going elk hunting with his friends John Simmons and Scott Wittman, and he only had one more week to wait. “For some reason, I didn’t want him to go to that particular area because of increased bear sightings” says Bonnie. The men were all seasoned hunters, skilled horsemen and experienced backwoodsmen. Their hunting grounds were just over a hundred miles away in the Lee Metcalf Wilderness, a 254,000-acre area with 11,000 foot peaks that bump up against Yellowstone National Park. The men didn’t want to waste any time once the season started, so John and John set up camp ahead of time. “We set up our camp about a week prior,” John Chepulis shares. “We were going to come out and spend the rest of the week at home, then go back in when hunting season started, but didn’t get out when we should have, due to a storm front which came through the day we wanted to leave. At their son’s suggestion, and to Bonnie’s relief, John purchased a SPOT satellite GPS messenger when they got home. A SPOT would allow John to send Bonnie an “I’m okay” message each morning and evening, and it could also send out a distress signal with their coordinates in the case of an emergency. Fast forward to three days into hunting season. The three men have their eyes peeled for elk. To their frustration, they had seen nothing but “signs of a lot of bear.” Finally, Scott spies an elk down that bears have been feeding on. Early the next morning, before sunrise, he and John Chepulis ride a mile or so up Shedhorn Mountain to check things out. “It was a pretty steep hill,” John Chepulis remembers. “We rode to the top, and all of a sudden my horse started acting up. I’m not sure what spooked him—I think maybe he smelled bear for the first time, or maybe it was the elk carcass itself. 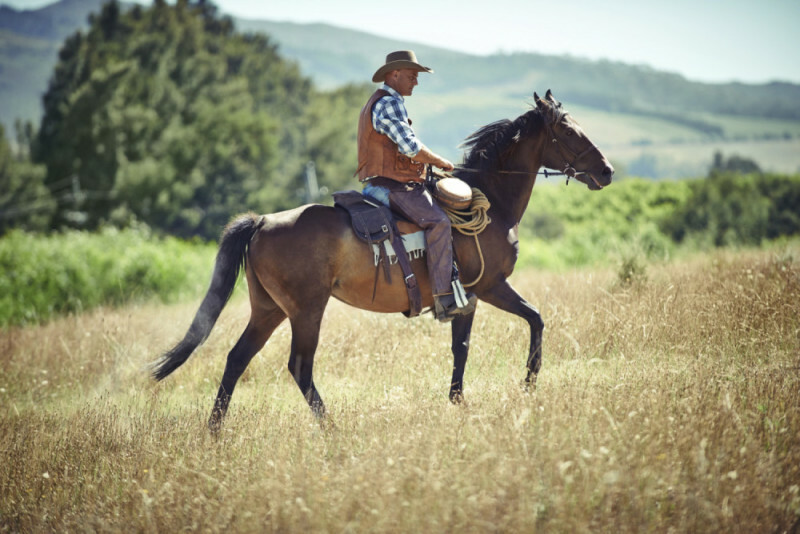 I don’t know exactly how I came off, but I landed on a tree branch, bounced and landed on a rock.” The commotion flushed three elk out of the trees, and John’s horse took off following the elk. John heard crunching because he had just broken 10 out of 12 ribs on his right side, front and back. He wasn’t breathing well because the broken ribs had punctured his right lung, and the lung had collapsed. This was a very serious injury. He is happy to be back in the saddle again. Back at camp, John Simmons looked through his binoculars just in time to see the elk run. He also recognized John’s horse—without John on top. “He knew something was wrong. He had been trying to contact me on a 2-way radio we carry for emergencies. I didn’t have mine turned on at the time. Scott didn’t really know what to do, other than try and keep me warm. After a bit I remembered the radio, gave it to Scott and he was able to communicate with John who has experience in wilderness first aid,” says John Chepulis. “He told Scott to keep me warm and keep me awake.” Scott put his leather chaps down for John to lie on, wrapped him up in a slicker and used a saddle as a windbreak. Meanwhile John gathered up a sleeping bag, tarps, and first aid items. He put them on a pack horse and headed up the hill to the accident site. “The way the SPOT works is the emergency signal goes to a SPOT station in Texas,” Bonnie explains. Texas had indeed received John’s signal. “Not only did they contact local search and rescue, they also contacted me,” she says. She received a phone call informing her that John’s device had been used to send an emergency signal, but there was a bit of an issue—the signal had disappeared. Those angels were Summit Air Ambulance’s flight crew who were trekking down the mountain to the accident site. Due to the steepness of the hillside the helicopter had landed in a safe place on top of the hill. It didn’t take long for the highly-skilled medical crew to recognize the seriousness of John’s condition. They contacted their pilot by radio, telling him he had to land closer as John couldn’t safely be carried to the top of the hill. 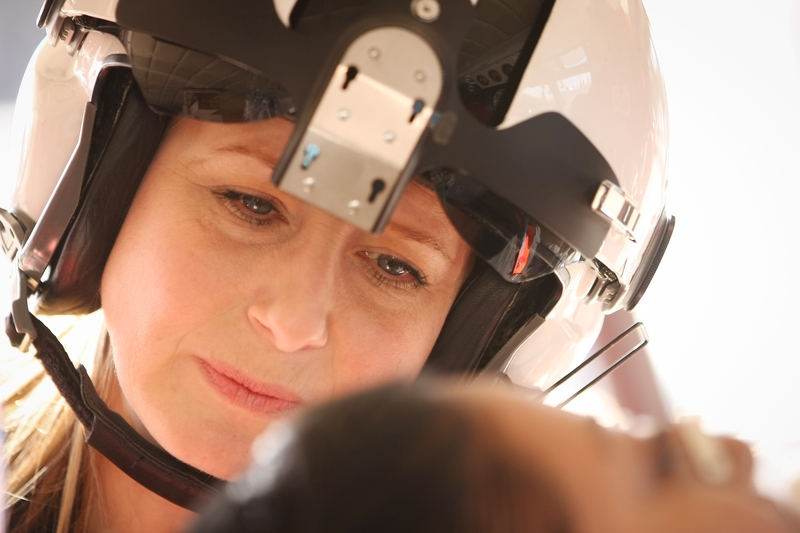 A caring flight nurse tends to a patient. John said, “I found out later they had to needle my chest to keep me alive on the way to hospital.” Needle thoracentesis – or “needling” – is when a needle is inserted into the chest cavity. The built-up air immediately flows out, the lung reinflates, and pressure and pain are reduced. John stayed at Bozeman Deaconess for 17 days, and he received the best care possible. On day 18, he took a helicopter ride he does remember. “Because I was a on a ventilator, Summit came back and gave me a ride from Bozeman Deaconess to Advanced Care Hospital of Montana in Billings,” John says. “That ride was kinda fun. The EMT was pointing out all kinds of different stuff.” John stayed at the facility in Billings for 12 days. He fared so well that he was released earlier than expected.